The many uses of lavender flowers are only limited to your imagination. Growing lavender plants will provide you with not only a beautiful edible flower garden, but also a medicinal herb garden. Fresh edible flowers are becoming extremely popular but hard to find for culinary use. Buying edible flowers can be a risk to your health. Since you only want to use organically grown flowers, free of all pesticides, it's so much safer to grow you own. 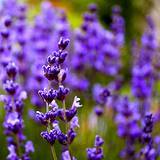 Lavender plants are perennial and requires dry, somewhat infertile soil with good drainage. They grow best in neutral or slightly alkaline soil in full sun. You can also mix lavender with potted plants for a beautiful addition to your deck or patio. Harvesting Fresh Lavender Flowers: Only harvest the fullest flowers, just as you would fruit. Pick flowers that are the brightest in color and haven't started to wilt. The freshest the flower the more flavorful the taste, so try to pick your flowers right before you are ready to eat them or use them for decorating you favorite recipes. Make sure you thoroughly rinse all the blooms by immersing them in water to remove any insects or loose soil. Lay the lavender flowers on paper or cloth towels and gently dab to dry. If you need to store them for a short period of time lay them in layers on paper towels in the refrigerator. Not all lavenders have the same culinary qualities. English Lavender has the sweetest fragrance of all the lavenders and is the most commonly used in cooking. It has a sweet floral flavor with a hint of lemon and citrus. It makes a beautiful and refreshing garnish for drinks, cakes, sorbets or ice cream. Queen Elizabeth I reportedly sipped lavender blossoms in tea. To this day, the French continue to send baby lamb to graze in fields of lavender, so their meat will be tender and fragrant. A small amount of lavender goes a long way, so use it sparingly in recipes. It may surprise you to know that lavender is actually a member of the mint family and considered to be a close relative of the popular herbs rosemary, sage, and thyme. Lavender has been a favorite herb and has been around for over 2,500 years. 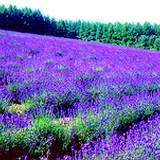 In ancient times lavender was used for mummification. Lavender's soft, sweet scent was used as perfume by the Egyptians, Phoenicians, and peoples of Arabia. The Greeks and the Romans bathed in lavender scented water and it was from the Latin word "lavo" meaning "to wash" that the herb took it's name. The English Lavender plants were introduced to America by the late 1600s. During the First World War the nurses bathed the wounds of soldiers with lavender wash. Lavender tea is ideal for people who suffer from nerves, headaches, dizziness or fainting spells. To make a cup of lavender tea just add one level teaspoon of dried lavender flowers to a cup of hot water, cover and let steep for at least 3 minutes, strain and enjoy. You can always add a few spoons of honey if you like a sweeter taste. 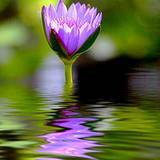 Lavender oil is excellent for aromatherapy. If you add just a drop or two to your pillow at night the aroma will lull you to sleep. Or if you're suffering from headaches just apply a few drops of lavender oil to your fingertips and massage your temple with it. You can also massage a few drops on your wrists or the back of your neck to clam you down. 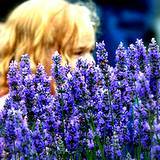 Many women, to this day, prefer using lavender oil mixed with various other essential oils for perfume. It will not only give you a calm effect it will also calm anyone in your presence. It's actually kind of fun to experiment with. Externally, Lavender oil is one of the safest essential oils and can be used full-strength on the skin. It works wonderfully and can be applied directly for cuts, scrapes, wounds, burns, bee, wasp, and insect stings, rashes, muscle aches, rheumatism, arthritis, cold sores, canker sores, blisters, bruises, athlete's foot, and rubbed directly into the temples in case of headache or migraine. Lavender has been used for centuries as an herbal remedy, and does indeed appear to have antiseptic, anti-bacterial, anti-fungal, anti-inflammatory, anti-convulsive, and last but certainly not least - anti-depressant properties. 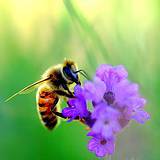 The fresh or dried flowers contain the medicinal properties of Lavender. For the little bit of room it takes to add a few lavender plants to your edible flower garden or you medicinal garden they are well worth the effort. You'll find they are extremely easy to plant, maintenance is simple and harvesting is so rewarding. You'll thank yourself every time you are sitting outdoors on summer evening and a simple breeze picks up the sweet relaxing scent.